It’s Galaxy Note 8 Day! Who has the Best Deal? The Samsung Galaxy Note 8 is now in stores! Even though many of you have had the phone in hands for some time now, thanks to pre-orders, if you were holding out for some reason, today is the day you can walk into a store and buy one. It’ll cost you close to $1,000 should you buy one without a deal, but since almost everyone is hosting some sort of Galaxy Note 8 deal, you’ll get you the new S Pen-powered phone from Samsung at a much lower price. Which seller has the best Galaxy Note 8 deal today? That’s going to be up to you to ultimately decide, since there are a number of factors here, including carrier, level of discount, if there is a trade-in involved, etc. We’ve tried to compile the best Galaxy Note 8 deals for you below to hopefully help make this process simpler. I like this deal a lot because it covers all carriers plus the unlocked model, and offers you an instant discount up to $300 as long as you have a decent phone from the past 2-3 years to trade-in that still works. And when I say “instant,” I do mean that. Rather than having to wait for your trade-in discount to come off weeks later, Samsung takes the discount off immediately at the time of purchase, only to ask you to send in the phone once your new Galaxy Note 8 arrives. They’ll then accept the trade, make sure the phone meets their standards (powers on and holds charge, normal wear and tear, functioning display, etc.) and let you know that you’ll see no extra charges and that the trade-in has been accepted. That’s it! They are currently offering $300 off for phones like the Google Pixel and Pixel XL, LG G6/G5/G4, Galaxy Note 5, S7, S7 Edge, and iPhone 7 or 7 Plus. But if you have a Galaxy S6, S6 Edge, or S5, as well as pre-iPhone 7 iPhone, they’ll still shave $200 off. So if you have a phone as old as the LG G4 ($300 off) and want to trade it in for the unlocked Galaxy Note 8 ($930), you’ll walk away with the phone for roughly the price of the Galaxy S8. That’s not bad. Oh, let’s also not forget that Samsung is still handing out freebies with purchase, so you can get either a free Gear 360 or a bundle that includes a 128GB microSD card and fast wireless charger. To see the full list and get that $300 discount up front, hit up that link below. T-Mobile is doing a mostly straight-up buy one, get one free deal on the Note 8. You buy two Galaxy Note 8 devices on 24-month equipment install plans (EIP) and then apply a redemption code after the fact for a rebate card that will let you pay off the second device. This gets a bit tricky since you have to pay $210 up front for each phone (so $420 out of pocket), because they cost $930 each and T-Mobile can only finance $720 per phone. When you get your rebate back, it’ll be for the full $930 to at least give you back that down payment and allow you pay the second phone off. Once you buy the two phones, you’ll then check for promo eligibility at this T-Mobile Promotions Center site by entering promo code “17CSAMN8BOGO” within 30 days of the second device purchase. Once you sign-up for the rebate, it’ll take about 8 weeks before you get your prepaid MasterCard (value up to $930). More details at this post. T-Mobile will also let you grab the freebies: Gear 360 or SD card/wireless charging bundle. Redeem here. Verizon’s deal is a pretty good one if you have a decent phone to trade-in. They’ll slash up to 50% off the price of the Galaxy Note 8, though the whole situation is a bit wonky. Verizon works this by not giving you $480 off (half the price) up front, they instead apply a promo credit of up to 50% off over 24 months with the device payment plan they require you to sign-up for. So you’ll get a credit back on your bill after a couple of billing cycles that’ll offset the cost/discount. I know that’s impossible to understand, but just know that you’ll get a discount, it’s just spread out over 2 years worth of monthly payments. I’d list out the phones that’ll get you $480 off the $960 retail price, but Verizon makes that impossible to figure out. You will have to walk you the process and plug-in your phone to determine its value. Again, this is a wonky deal at best. Verizon will also let you grab the freebies: Gear 360 or SD card/wireless charging bundle. Redeem here. AT&T has a couple of Galaxy Note 8 deals to be aware of. I’ll try not to make this confusing, but one is a $300 trade-in offer, while the other is sort of a buy one, get one free, though the second one won’t be fully free because of the price of the Note 8. Trade-in deal: The trade-in deal is similar to Samsung’s because AT&T will give you up to a $300 prepaid AT&T card the minute you trade-in an eligible phone. That card can then be used to pay off up to $300 of the Galaxy Note 8 you just bought. It is a “Private Label AT&T Promotion Card,” though, so it has to be used to buy things from AT&T or pay off bills. Semi-BOGO: I’m calling this the “semi-BOGO” because it almost gets you a Note 8 for free after buying one. 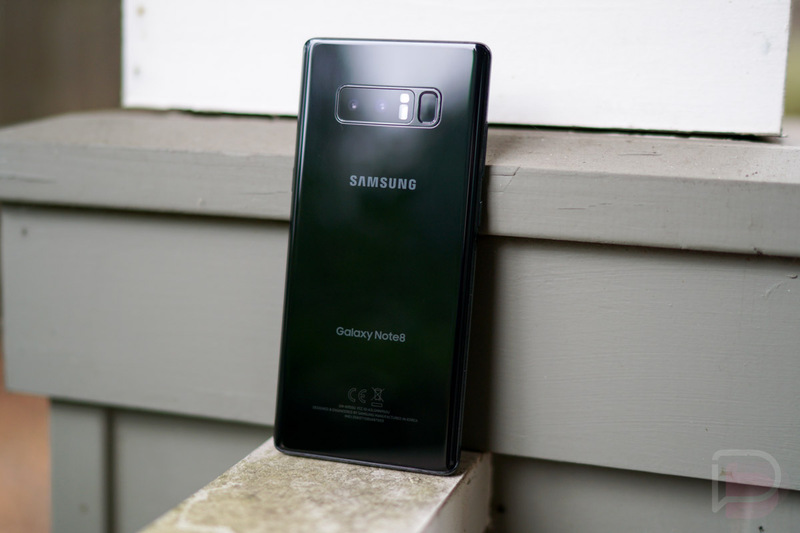 It works like this – you buy two Galaxy Note 8 phones with an AT&T Next or AT&T Next Every Year installment plan and then receive bill credits for the second device that should cover the cost. The thing is, the bill credits max out at $750, so since the AT&T Note 8 costs a whopping $950, you’ll have some extra to pay in there. AT&T will also let you grab the freebies: Gear 360 or SD card/wireless charging bundle. Redeem here. If you don’t plan on owning the Galaxy Note 8 and are on Sprint, you can get the phone at 50% off through their 18 month lease program. No trade-in is required either, all you have to do is sign-up with Sprint and their Flex Lease, and choose the Note 8. You’ll pay just $20 per month for the life of the lease. Also, if you want to keep the phone for less time than that, their Galaxy Forever program will get you a new Galaxy phone after 12 monthly lease payments. Sprint will also let you grab the freebies: Gear 360 or SD card/wireless charging bundle. Redeem here. And if you don’t want to go through a carrier or Samsung, feel free to head over to Best Buy. Best Buy basically has most of the deals above, outside of T-Mobile, since they don’t sell T-Mobile service. But you’ll find the 50% off trade-in deal at Verizon, the BOGO from AT&T, and the 50% off lease deal from Sprint. It does not look like they are currently offering discounts on the unlocked models.